When I was looking through the Christmas edition of Tesco magazine I came across some great craft ideas. 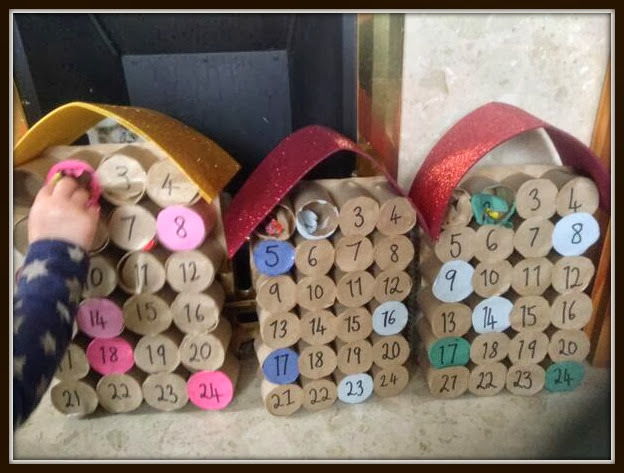 When I saw this advent calendar I knew my children would like it and I thought it was just so plain, simple and effective. We are rollophobics in this house so we had enough rolls for a couple and we had the others donated (hence one is bigger). I won't take the credit for the creation of these, the instructions are on the web page but if I made them again I would modify them a bit. I wouldn't bother cutting the roll in half I would just use full ones. You will get a better shape and the holes will be slightly bigger so you can put bigger toys in. In the instructions it suggests that you should cut individual circles for the back as well. I just filled the holes from the back and stuck a whole piece of brown paper on the back, mainly to save time because I had 3 to make but I think it look fine. The main thing is the children love them. Some days they get chocolate, sweets or toys. They love the surprise.